Product Description: less text It has been said that Christmas is love in action. This festive season send some love and cheer to your nearest and dearest when you send them this fabulous gift from NetFlorist. This edible arrangement comes styled to look like a snowy, elegant Christmas tree and is made up of delicious Lindt chocolate truffles that come decorated with a golden, Christmas garland and topped with a traditional shining star. Send this gorgeous gift with NetFlorist today to make anyone's Christmas the best that it can be! 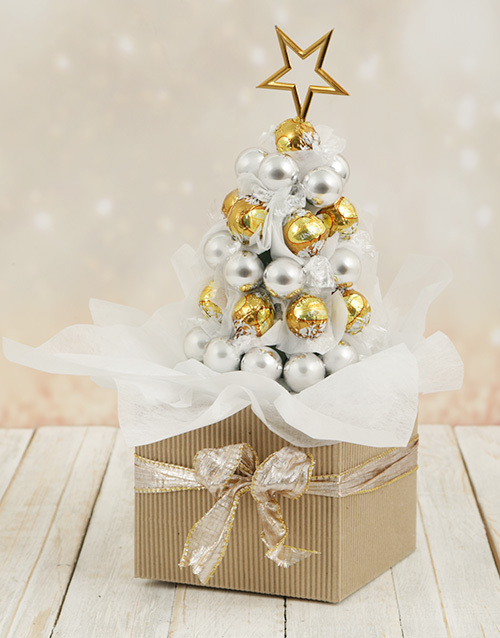 Christmas Deco may vary Get this Golden Lindt Edible Christmas Tree delivered with NetFlorist. "What a great gift idea!! LOOOOVE IT!"